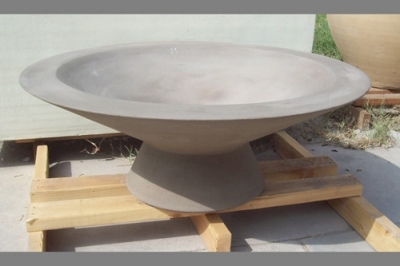 Concrete Fire Bowls.. We don't make these, however, we can help you find them! 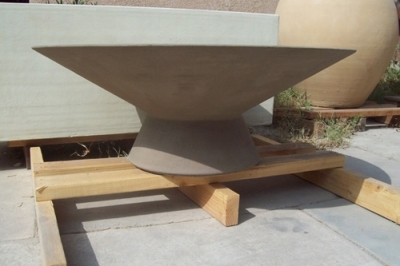 We do not make or sell concrete fire bowls. 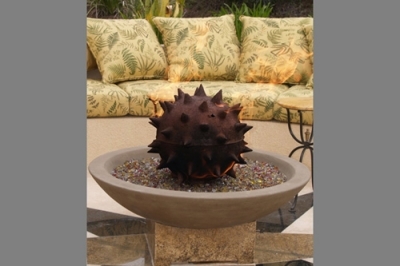 We do sell the burners and glass to make you concrete fire bowl beautiful! 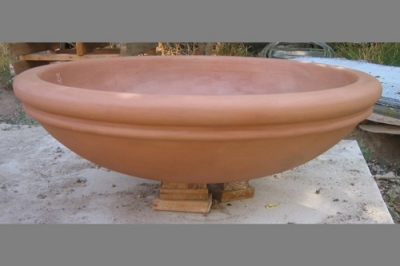 If you are looking for concrete fire bowls or fire pits, try these links and try to locate a local supplier. 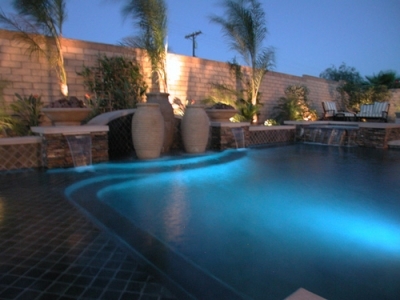 We can provide you with the correct burners and glass you will need to complete your project. 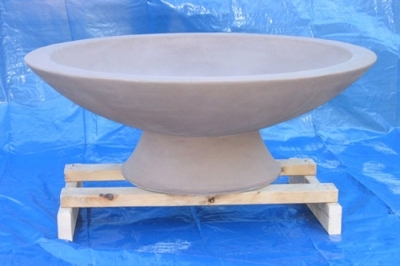 The Asian Wok is a modern shaped bowl that could work in many projects including contemporary or Asian style projects. 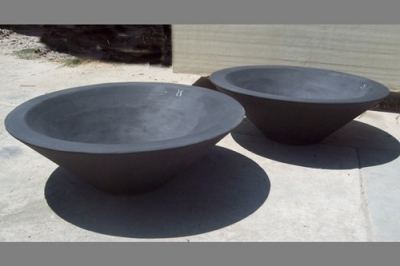 The Asian Wok Bowl shown in the main photo is 31" w x 10" h and is in our smooth #90 finish in Ebony Color, and a few will be used as Fire Bowls at a pool project in Texas. *All sizes marked with * will have the same proportion as in photo. 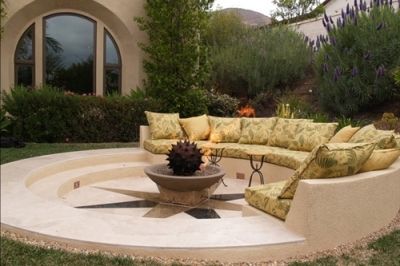 When used as a Fire Bowl, the required distance between the inside walls and the fire ring should be 5” all around. Use ONLY Lava rocks, or Fireglass that is intended for fire use. 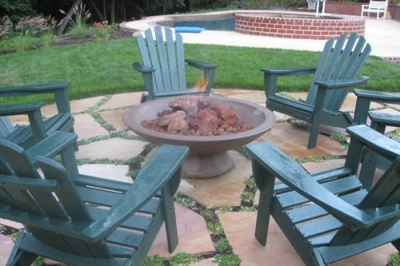 Follow ring manufacturer instructions as far as the fire ring installation. 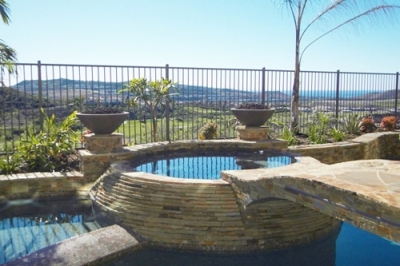 Make sure Lava rock, and or Fireglass are appropriate for use with Gas, Propane, etc. Built with a 2"-3" hole for the gas line at the bottom. A small opening should be left open for drainage, or we can have another small hole for drainage. Sitting together around the Fire Pit is great family tradition. 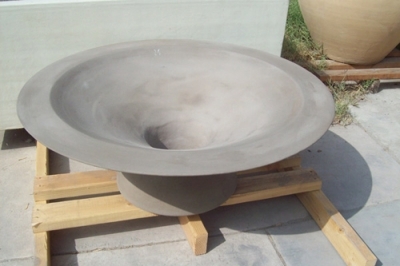 The Asian Wok with leg Fire Pit is a modern clean line shaped bowl that can work in many projects including contemporary or Asian style projects. 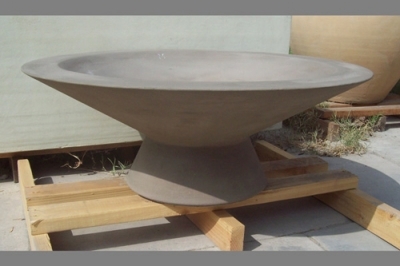 The Asian Wok with leg Fire Bowl shown in the main photo is 36" w x 13.5" h in our smooth #90 finish in the Latte color. As always leg size can be modified. 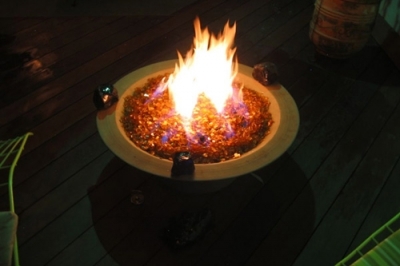 When used as a Fire Bowl sand should be placed inside the bowl so that the fire does not directly touch the concrete. You can light either wood logs, or use a gas line and lava rocks or even Fireglass. 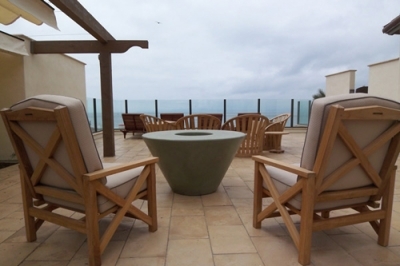 Our Cone Fire Table is decorating the Terranea Resort in Palos Verdez in California. The Cone Fire Tables in the photos are 48" w x 26" h with 18" opening for the fire in our smooth #90 finish in two different colors, Sage Green & Rosewood by Colorful. 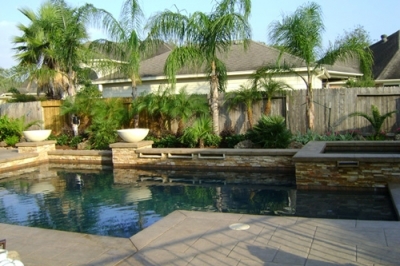 This project was designed by Burton Landscape Architecture Studio and was built in cooperation with Turner Construction & The Masonory Group. 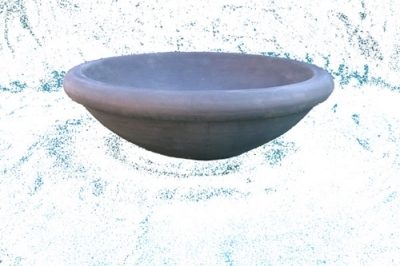 When used as a Fire Bowl sand and Fire Rocks should be placed inside the bowl so that the fire does not touch directly the concrete. Always use materials that are intended for use in fire. 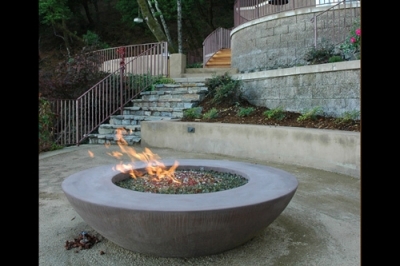 This Custom Simplicity Fire Bowl was designed by Studio Green for a residence in San Anselmo, CA. 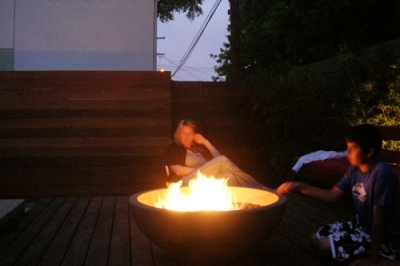 The Custom Simplicity Fire Bowl was designed to have a oversize 12" lip. 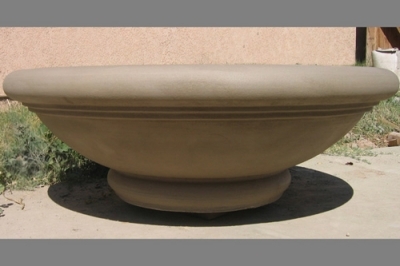 The size of the bowl is 60" w x 18", in Coffee color smooth #90 finish. 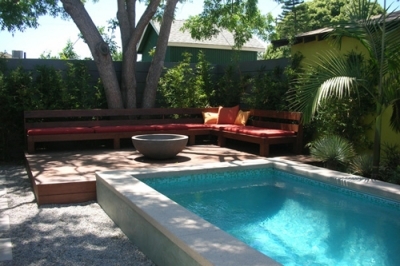 As Concrete Creations worked closely with the Landscape Architect to achieve the desire results. The bowl in the photo is our Meron Flat . The size of the Meron Flat in the photo is 24" w x 8" h in our smooth # 90 finish in the ebony color. 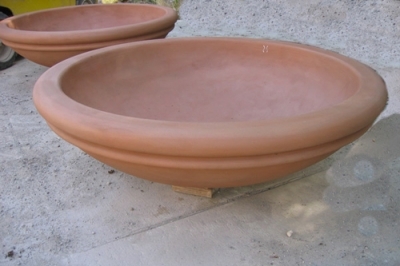 In other photos the sizes are 36" w x 12" h.
When used as a Fire Bowl sand and rocks should be placed inside the bowl so that the fire does not touch directly the concrete. 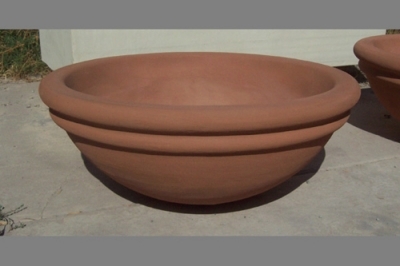 The Meron Flat Ribbed bowl in the photo is 43" w x 12" h in our smooth #90 finish in the color Paloma . 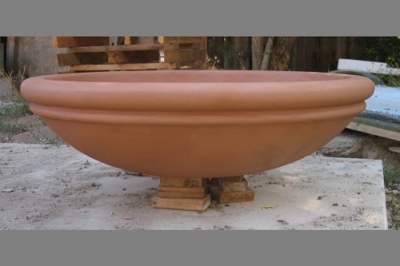 The Fire Pit Bowl in the photo is our Prairie Fire Bowl, it is 30" w x 12" h in our smooth # 90 finish in the color Paloma. 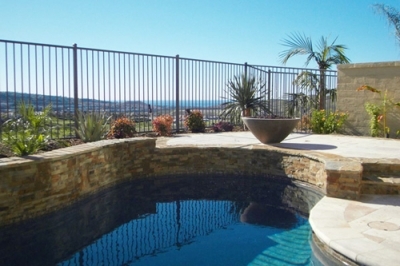 A 4"-5" distance between the fire ring and the concrete wall should be kept. 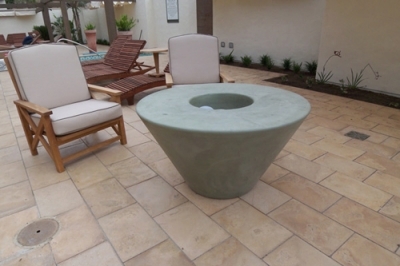 The fire pit bowl in the photo is our Simplicity Fire Bowl, it is 40" w x 15" h in our smooth # 90 finish in the color Smoke Gray. 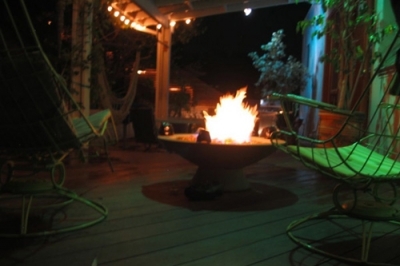 The Fire Bowls in the photo are our Simplicity Fire Bowls they decorate a residence in the great state of Texas. 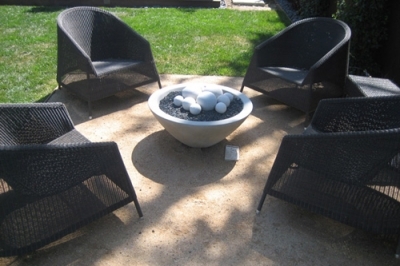 The size of the Simplicity Fire Bowls in the photo are 36" w x 13.5" h in our smooth # 90 finish in the color Pearl White. 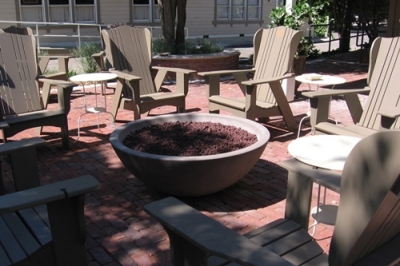 The fire pit bowl in the photo is our Simplicity Fire Bowl, it is 48" w x 18" h in our smooth # 90 finish in Coffe Color. 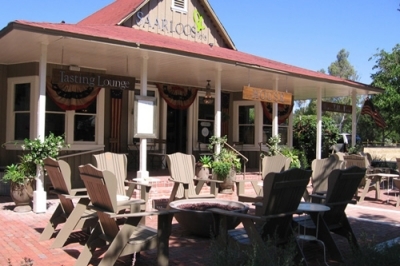 It decorate the Saarloos House in Los Olivos, CA and is part of a water and fire design. 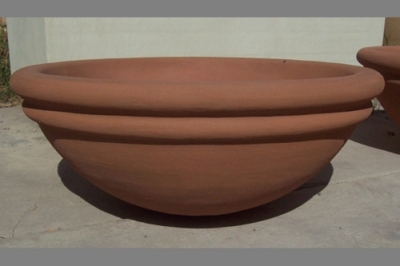 The two identical 48" w Simplicity Bowls have fire in one of them and water in the other. 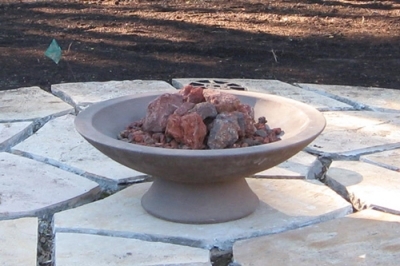 When used as a fire bowl sand and Lava rocks should be placed inside the bowl so that the fire does not touch directly the concrete. 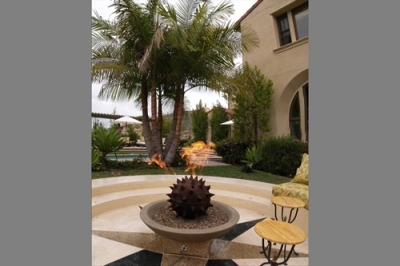 The Fire Bowl in the photo is our Tivoly in the size 36" w x 12" h in our smooth # 90 finish in Aztec Gold. 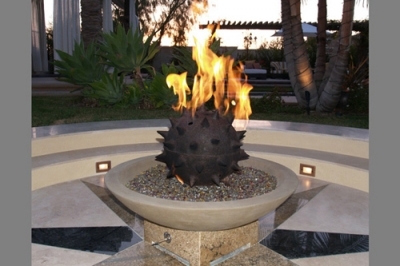 Can be used as a fire pit. 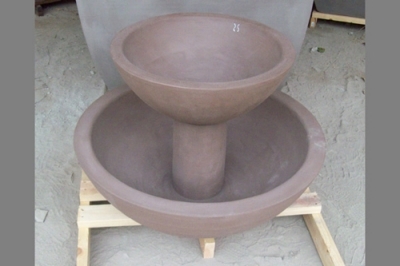 This new Water and fire- Simplicity double bowl feature was designed in cooperation with Isaac Ogle Landscape, and will be installed in Arkansas. 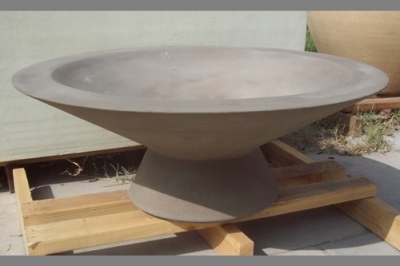 This special design utilize a large Simplicity Bowl 40" w x 15" for the water built with a special customized pedestal design to hold a smaller 24" w x 10" Simplicity Bowl to be used as a fire bowl. 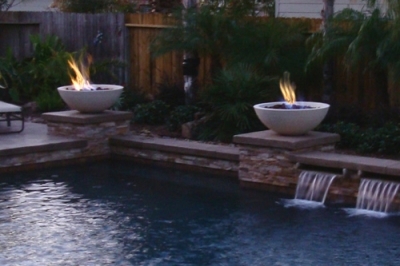 The Simplicity Bowls design repeats itself all around the pool, as planting bowl, fire bowl, and water bowl and compliment the entire design. As always you can pick your size and have fun with the design! 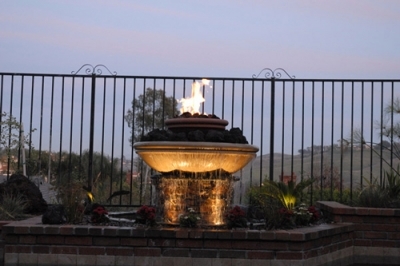 This Water and fire feature was designed and installed by Royal Gecko Land Art Inc. based in Mission Viejo, California. 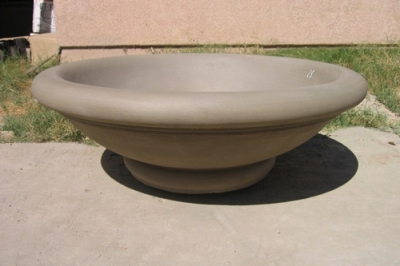 This special design utilizes a large Meron Flat Ribbed 48" w x 13.5" built with a special customized pedestal designed to hold a smaller 24" w x 8" h Meron Ribbed bowl to be used as a fire bowl. 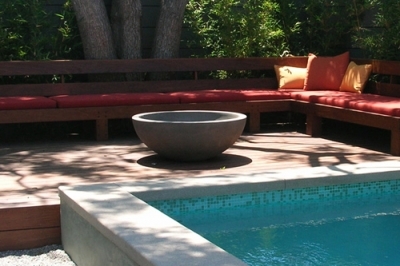 The Meron Flat Ribbed bowl design repeats itself all around the pool, as planting bowls, fire bowls, and water bowls and compliments the entire design. As always you can pick your own size and have fun with the design! 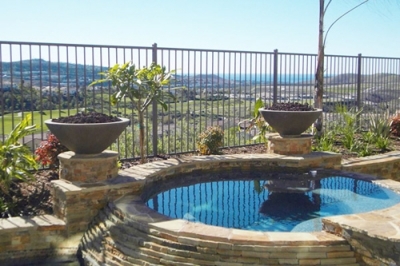 Our Wok Fire Bowls and Wok Fire Pit are decorating this residence in Orange County California. 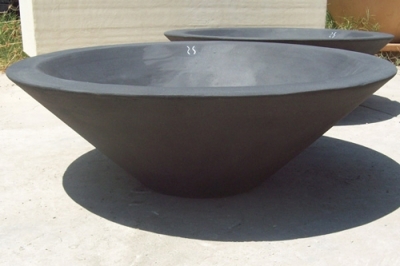 The size of the two Wok Fire Bowls is 30"w x 12" h, the size of the single Wok Fire Pit is 36" w x 16" h. All three Woks are in the smooth #90 finish in the color Coffee. 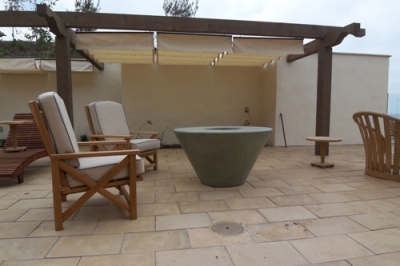 Our Wok Fire Bowl is decorating a residence in Orange County California. 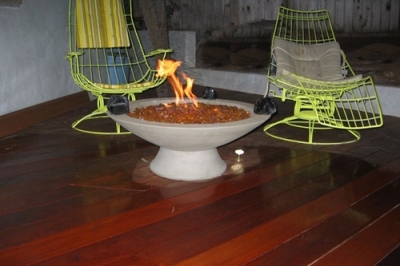 The custom size of the Wok Fire Bowl in the photo is 36" w x 9" h in our smooth # 90 finish in Bronze. 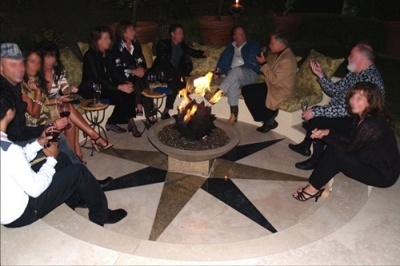 This project was called Fire Pavilion and was built in cooperation with a very talented artist, Christopher Lee, the owner of Glass Concepts who designed and built the entire seating area, and special sphere. 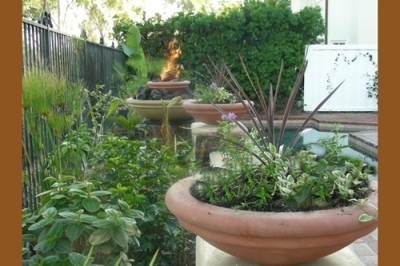 The size of the Wok Fire Bowl in the photo is 30" w x 12" h in our smooth # 90 finish in the color Gray. 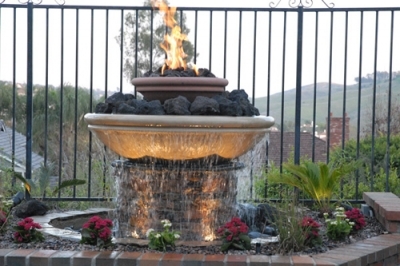 The Wok Fire Bowl decorates a house in Orange County, CA. 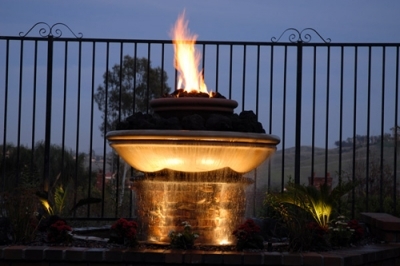 The Wok Fire Pit is a modern yet classically shaped bowl that can work in many projects including contemporary or Asian style projects. 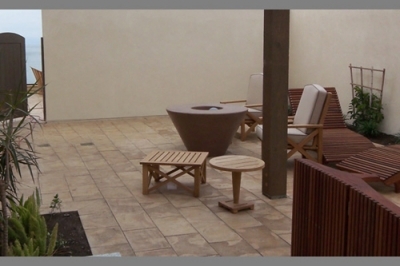 The Wok Fire Bowl shown in the main photo is 42" w x 15" h in our smooth #90 finish in the color Coffee. 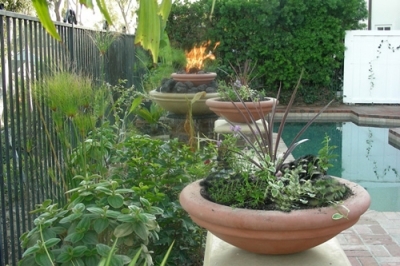 When used as a fire bowl sand and rocks should be placed inside the bowl so that the fire does not directly touch the concrete. 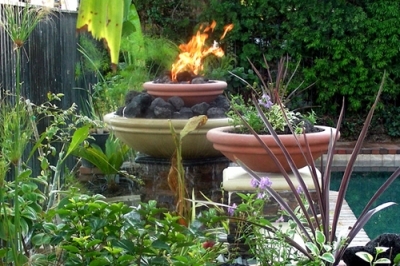 If you are looking for concrete fire bowls or fire pits, try these links and give us a call direct at 253-225-9591. We will help you locate a local supplier and provide you with the correct burners and glass you will need to complete your project.